FME™ Cloud is the flexible way to automate the flow of data between nearly any combination of cloud and on-premises applications. FME Cloud is the hosted version of FME Server. 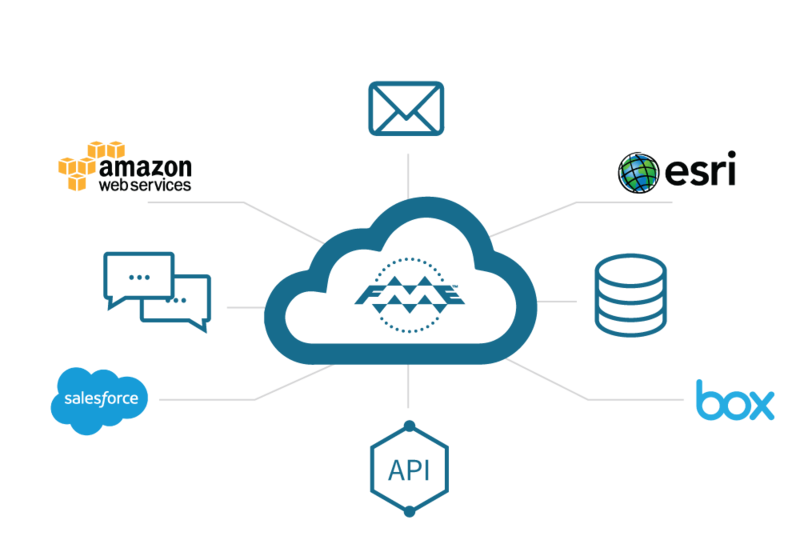 It's the ultimate platform for connecting the web, combining the automation power of FME Server with the flexibility of the cloud. No other tool is able to handle the complexity of spatial data in apps like Google Maps, ArcGIS Online, CARTO, and hundreds more. Start by building integration workflows in FME Desktop's drag-and-drop interface. Then use FME Cloud to run them constantly in real time, in response to events, or on a time interval. Scale up or down as needed. It takes less than 10 minutes to get FME Cloud up and running. No request form, no office politics, and no costly hardware to maintain. We handle the infrastructure for you. This quick setup makes FME Cloud ideal for pretty well everyone! It also makes FME Cloud ideal for rapid prototyping before moving to an on-premises FME Server. Our pricing is straightforward and transparent. Choose pay-as-you-go pricing for flexibility or lock in the savings with an annual rate. Either way, it's easy to scale up or down without sacrificing performance or worrying about excess capacity. ​Security is # 1. Play it Safe. We didn't pick the name Safe Software back in 1993 because of cloud security, but it's now a happy coincidence! The safety and security of your data is our top priority. FME Cloud's architecture is built using the physical infrastructure of Amazon Web Services, providing many benefits, like the ability to choose where your data is stored as well as industry-recognized certifications and audits including ISO 27001, PCI Level 1, and SOC 1/2. All connections are made over SSL using high-grade encryption, and two-step authentication is available for added security. FME Cloud offers role-based permissions and provides regular backups. Plus, unlike other providers, we follow a single-tenancy model which means nothing of yours is shared with other customers. Additional engines allows you to process jobs in parallel, ideal for web data from many sources. You can add as many engines as you want, but keep in mind that performance for larger jobs may be constrained by hardware. You're in control of your costs and hardware. Change the instance or disk size within one minute. Schedule your instance to run at specific times. Take backups with the click of a button. Changes are easy to make in FME Cloud. We use FME Cloud for our business operations too, so we understand that everything just has to work. FME Cloud is built on leading cloud technologies and is backed by a company that's been moving data for over 20 years. Our REST API puts you in control. Requests are made through clear URLs and responses are formatted in clear, readable JSON. FME Cloud also plays nicely with other APIs, making customized integrations easy. Even if your service goes viral, FME Cloud can handle it. During peak demand, scale up to take advantage of the limitless computing capacity of the cloud. During periods of inactivity, scale down to save money. You're not at your desk 24/7/365. FME Cloud supports mobile devices, allowing you to manage your instance on the go. You can also set up customizable alerts to notify you of possible issues. No waiting on fixed release dates. Product improvements are ongoing throughout the year, and you're in control of how they're applied. The most popular way is to simply enjoy the new features, letting it all happen automatically. Launch an FME Cloud instance in one of six AWS regions around the world: US East (Northern Virginia), US West (Oregon), Sydney, EU Frankfurt, EU Ireland, and Canada (Montreal). "Our rack space costs (real estate on our data center floor) were $3,800 per month. Add to that the hardware costs, etc and you start to see why moving to the cloud was a no brainer for us." "Other state agencies are now seeing the benefit of using the cloud to deliver large data volumes quickly and reliably." Compare what's different between your two deployment options. Browse a library containing demos of popular uses cases. Learn how to get started with FME Cloud by visiting our community and knowledge base. Claim a Free $250 Credit for FME Cloud.